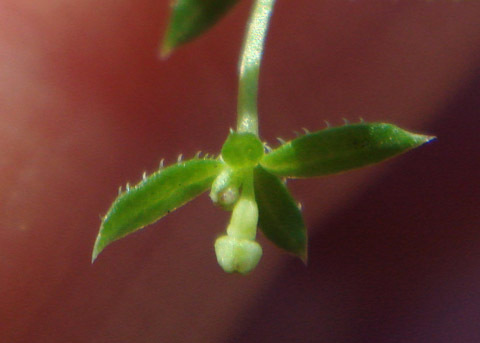 Male flower. Limestone Canyon Wilderness Park, Irvine, CA. 2-4-12. © Joan Avise. Occasional on dry slopes in coastal sage scrub and chaparral; Chino Hills, eastern foothills, and Santa Ana Mountains (Roberts). 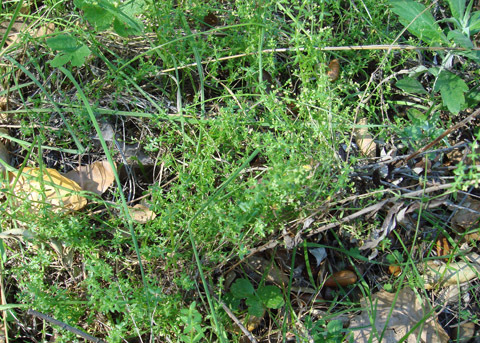 Note that this species is very difficult to distinguish from G. porrigens. 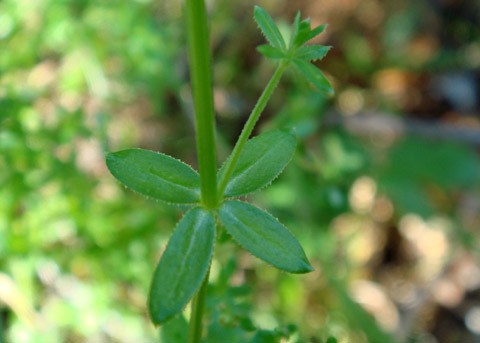 Leaves opposite but appear whorled because of two leaf-like stipules not obviously different from the leaves. 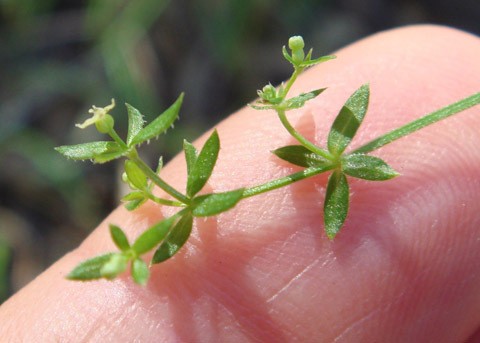 Leaves linear to narrowly ovate, 3-8 mm., generally leathery, tip acute, sharp to touch with stout, persistent hair (JM2). Limestone Canyon Wilderness Park, Irvine, CA. 2-4-12. © Joan Avise. Limestone Canyon Wilderness Park, Irvine, CA. 2-4-12. © Joan Avise. 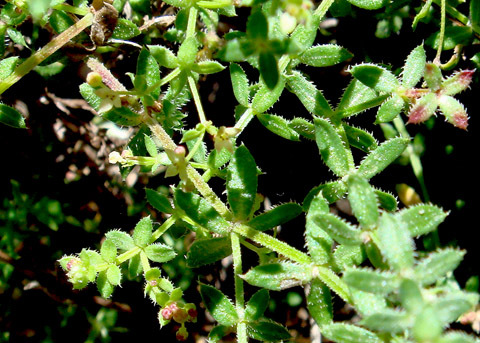 Leaves with sharp acute tips. Limestone Canyon Wilderness Park, Irvine, CA. 2-4-12. © Joan Avise. Developing fruit. Limestone Canyon Wilderness Park, Irvine, CA. 2-4-12. © Joan Avise. 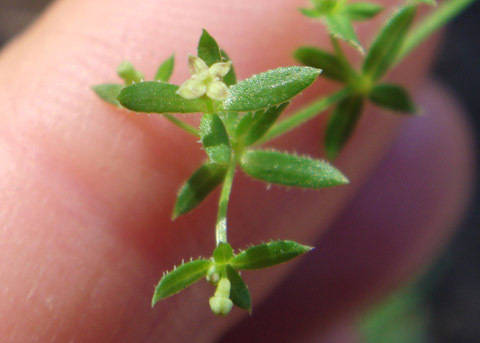 Female flowers solitary from leaf axils. 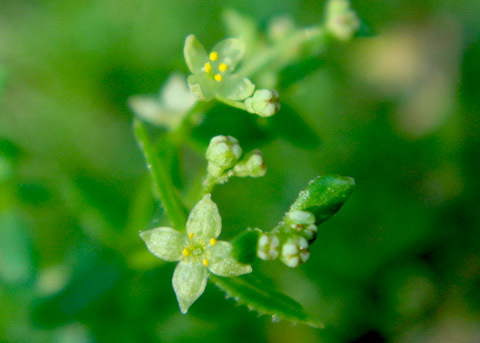 Two-lobed ovary with two styles, vestigial anthers; no sepals; 4-lobed corolla greenish yellow to red, 1/8 in. across. Developing fruit. Limestone Canyon Wilderness Park, Irvine, CA. 2-4-12. © Joan Avise. Female, developing fruit. Limestone Canyon Wilderness Park, Irvine, CA. 2-4-12. © Joan Avise. 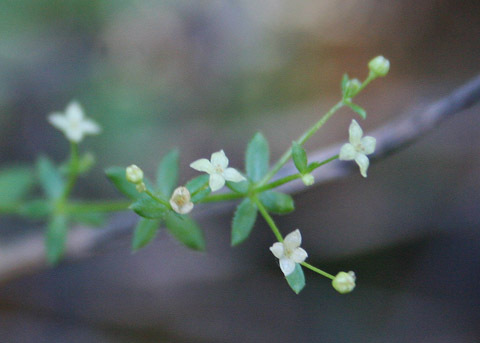 Male flowers in few-flowered cymes on leafy branches. Limestone Canyon Wilderness Park, Irvine, CA. 2-4-12. © Joan Avise.